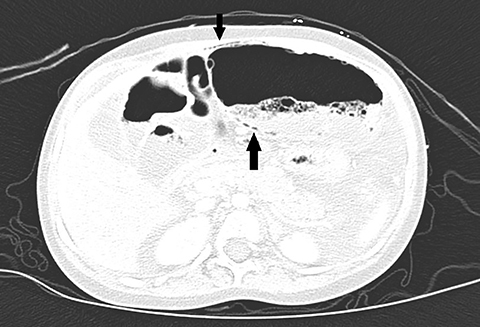 A 9-year-old male presented to the emergency department with two days of non-bloody, non-bilious emesis and one day of abdominal distention. His past medical history was significant for Smith-Lemli-Opitz syndrome, neurogenic bladder, recurrent urinary tract infections, severe developmental delay, history of malrotation status post Ladd procedure, and gastrostomy tube dependence. Physical exam was notable for a moderately distended abdomen. Radiographs were obtained on presentation. Supine image (Figure 1) shows central dilated loops of bowel with decompressed small bowel and distal colon. The image also demonstrates the presence of intramural bowel gas (pneumatosis intestinalis). Decubitus image (Figure 2) shows air-fluid levels in the colon, which can be a nonspecific finding. Given these findings, a CT scan of the abdomen and pelvis was performed. 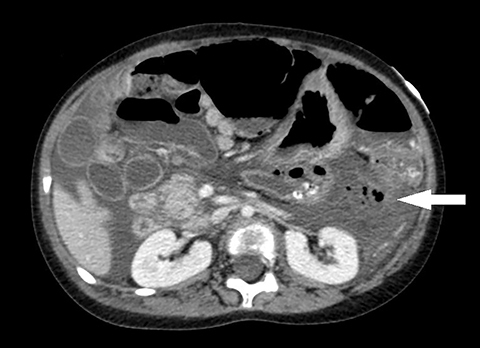 Axial CT images, in soft tissue window, show a large dilated loop of bowel in the left upper quadrant (Figure 3) as well as pneumatosis in the colonic wall (Figures 3). 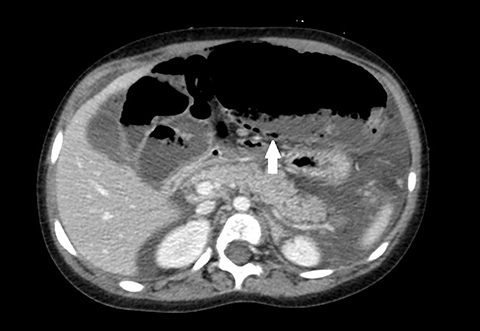 Axial CT image, in lung window, demonstrates more clearly intramural bowel gas and free air in the abdomen (Figure 4). 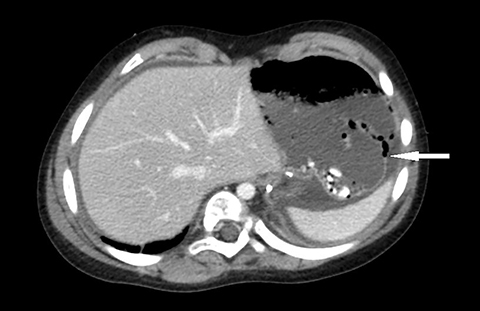 Axial CT image, in soft tissue window, shows significant ascites and extra-luminal fluid and air in the retroperitoneum (Figure 5). 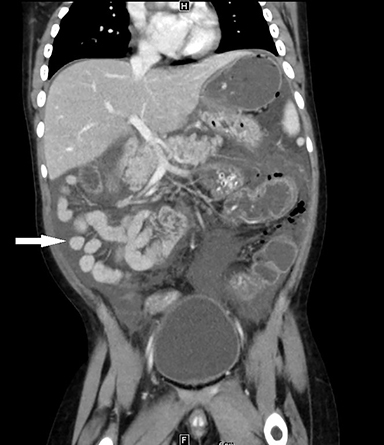 A coronal CT image, in soft tissue window, shows the stomach, distal colon, and small intestine are decompressed. 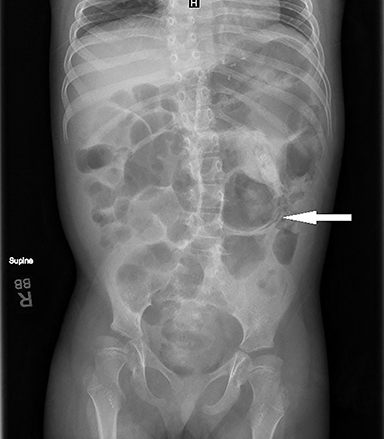 The small bowel is present in the right side of the abdomen, consistent with the patient’s history of malrotation (Figure 6). The differential diagnosis includes bowel ischemia, bowel perforation, necrotizing enterocolitis (given the presence of pneumatosis), intra-abdominal abscess, adynamic ileus, or Ogilvie syndrome. 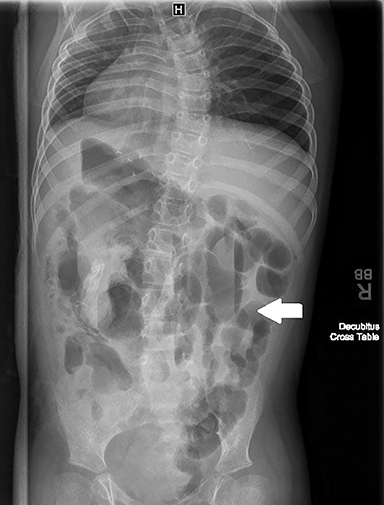 Abdominal radiography is typically the first imaging study obtained in patients suspected of having a bowel obstruction and should include supine and decubitus films. Large-bowel obstruction should be considered if the colonic diameter is greater than 6 cm and in the presence of air-fluid levels, although these findings are not specific for obstruction and can be seen with paralytic ileus and toxic megacolon. Complications of LBO including pneumatosis intestinalis, pneumoperitoneum, and portal venous gas.2 A CT abdomen and pelvis study with IV contrast is the gold standard for diagnosing bowel obstruction, and is useful in identifying the cause and location of the obstruction. CT will demonstrate dilated, thin-walled colon proximal to the transition point and compressed bowel distal to the obstruction.2,3 It will also confirm findings of intramural bowel gas or free intra-abdominal air as seen on plain radiographs. Although much less common than small-bowel obstruction, large-bowel obstruction can occur in the pediatric population and is an abdominal emergency. Clinical history includes vomiting, abdominal distension, and obstipation. Abdominal radiographs can raise suspicion for obstruction by demonstrating dilated colon and the presence of intramural bowel gas or pneumoperitoneum. A CT study of the abdomen and pelvis is the gold standard for diagnosing large-bowel obstruction and can be useful in delineating the etiology and location of the obstruction. Hryhorczuk A, Lee E, Eisenberg R. Bowel obstructions in older children. AJR. 2013; 201:W1-W8. Jaffe T, Thompson W. Large-bowel obstruction in the adult: classic radiographic and CT findings, etiology, and mimics. Radiology. 2015; 275:651-663. Large-bowel obstruction. Radiopaedia. https://radiopaedia.org/articles/large-bowel-obstruction. Jones J, et al. Accessed 1/22/17. Sawai R. Management of colonic obstruction: a review. Clin Colon Rectal Surg. 2012; 25:200-203. Hamouda N, Jorgensen SA, Towbin AJ, Towbin R. Large-bowel obstruction. Appl Radiol. 2018;47(11):28-30. Prepared by Dr. Hamouda while with the Department of Pediatric Emergency Medicine, Phoenix Children’s Hospital, Dr. Jorgensen and Dr. Richard Towbin while with the Radiology Department, Phoenix Children’s Hospital, Phoenix, AZ; and Dr. Alexander Towbin while with the Radiology Department, Cincinnati Children’s Hospital, Cincinnati, OH.